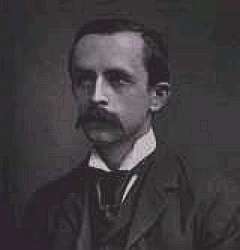 Sir James Matthew Barrie was a well-known author and playwright, best known for his play Peter Pan. In Sherlockian Circles, he is best know for the famous parody, The Adventure of the Two Collaborators, a parody of Dr. Watson's Sherlock Holmes writings, which featured his friend, Sir Arthur Conan Doyle, Sherlock Holmes, Dr. John H. Watson and himself. This famous apocryphal work was written in 1893 on the flyleaf of a gift-book, given to Sir Arthur, in honor of their failed theatrical collaboration, Jane Annie.